Ramblings of a girl who runs a lot of miles and drinks a lot of coffee. Another week of hard work done. Another week closer to a stellar marathon. I’m getting more and more excited to race Nashville. Strong weeks remind me what I’m working for and how much I’m improving. It’s such a good feeling to know the work you’re putting in is worth it. Race day is the pay off and I’m happy to be working hard every week to get there. Total of 7 miles at 8:50 average pace plus the rowing and strength intervals covered during my Torch class. Getting up at 5:10 AM on a Monday is never easy for me, but I’m always glad I did. Hoping to make this a Monday habit again. The strength and rowing is so good for my running. Normally I just do a short, easy run on Tuesday, but I decided to take a spin class today too. 6 AM 45 minute cycling class at Studio Three followed by 4 easy miles in the rain at 8:59 average pace. I think it helps to loosen up my legs with a run after spin as far as soreness goes. I felt pretty strong even on my burned out legs. And I was so glad to have all of this done by 7:40 AM. Seven easy morning miles at 8:45 average pace for my Thursday workout. It was another 50 degree day in February so I ran in shorts and enjoyed the sunshine. A rare thing for a Chicago winter and I think it will be the last day like this for awhile. Love when easy miles really feel easy. Friday is the rest day and I was looking forward to it all week. My legs definitely needed it! 18.50 miles of Barrington hills at 8:12 average pace. This was a tough run, but I felt stronger than expected. It was only 20 degrees with a real feel of 6 and there was blowing snow. Chilly wind wasn’t something I’d felt in a couple weeks so it made the run harder, but this group of women is so tough. We held 8:10-8:30 pace for about the first 12 miles then picked it up to 7:40-7:50 for the last 6 miles. Fast finishes are my favorite. I love running with this group because the miles fly by and everyone is so motivating. Couldn’t have made a better decision to join this group. I wouldn’t have thought this kind of long run was possible for me! Getting stronger and stronger. Holy cross training day! Signed up for 3 classes. Yes, this is a little much, but I was signed up for a GRL PWR ride before Kyle said he wanted to take Sayre’s 4 PM cycle and I couldn’t say no to his first Studio Three class. And of course I had to head to Sunday evening 75 minute flow to relax and recover. 90 minutes of cycling the day after 18.5 fast miles was a little ambitious, but I survived and savored the stretching at yoga after. Yoga really does do great things for my mental state. I leave feeling so grateful. I really love my cross training days, especially when it means spending them at the studio. I worked really hard this week. I’m surprising myself week after week and I actually feel like this is my strongest marathon training cycle yet. And marathon training is my one of my favorite parts of my life. Nothing beats the feeling of improvement. Another week done. Only ten weeks away from marathon day! I’m really happy with my mileage this week. I hit the number I was supposed to and had a few bonus miles. And all of my runs were outside! The weather has been so mild for a Chicago winter and I’m not complaining. Any day I can get outside for miles is a good day. I was supposed to run 7 Monday, but I switched it with the Tuesday 5 instead because I was having a lot of stomach pain during this run. It wasn’t exactly enjoyable, but I held an easy 8:40 average pace and took in the stillness. Night runs are sometimes just what I need. Got up and got my 7 miles in before work. Held an 8:38 average pace and was so happy to have the miles in early. The sun was even shining during the run. Crazy what that does for my mood. 1000 meter repeats are never my favorite, but this week they weren’t so bad. I ran to the store, so I had an extra long warm up (3.1 miles). Workout was 1000 meters x 5 with 2 minute rest in between. Reps were: 4:32, 4:32, 4:28, 4:31, 4:23. 1.76 mile cool down. Reps were supposed to be done at 10K pace, and 7:13 average might have been a little fast, but it felt good. Totaled 8.32 miles and I got home just as my Garmin died. Evening run followed by a strength class at ENRGi. Snuck in 6 miles right from work at 8:11 average pace. The class was all barbell work. I had never taken this kind of class before and I was surprised by how much I liked it. I always feel like my form is wrong or I get intimated by super strong people around me, but I held my own. It was the perfect amount of strength work after a run. I’ll definitely try this combo again. Rest days are the best days. Trying to really treasure the day of recovery. I know my body needs it! Another great long run with the group. 14 miles. 8:14 average pace. It’s weird to be at that point in training where I say “oh I only have 14 miles.” That’s where my head’s at though and I love it. Anything less than 16 miles we stay on the Lakefront Path, so it was nice to have a flat run. We did add in two reps of Cricket Hill for a bit of variety, but it was nothing like the Barrington hills. And did I mention I ran in shorts? 55 degrees in February is absolutely crazy for Chicago. I was just happy to be out there enjoying the beautiful day. Felt strong! Cross training day! Took a tough Torch class at Studio Three this morning. Covered 2 miles during treadmill intervals. This class was tough because it was 10 minutes at each station. The last rowing set nearly killed me. Okay, not really…but my arms and legs were dead. And I wasn’t thrilled about the burpees on my sore legs, but hey I’m glad I pushed through it. Continuing recovery with a Yoga Flow 75 this evening. It’s been too long since I’ve flowed and I’m so so excited. My legs will thank me! This training cycle is flying by. Can’t believe tomorrow starts week eight. I really think this is the best I have handled marathon training with cross training and real life. I’ve made training a normal part of my day to day life and it doesn’t keep me from doing other things I care about. I feel good about where I’m at mileage wise at this point and I’m ready for 10 more weeks of hard work! I love to eat. I’m the “oh Dale’s probably hungry” girl. Yes. I’m always hungry. I often plan my day around my meals and find myself thinking about my next snack hours before I have it. Marathon training makes me have a crazy appetite, but I know I need the fuel to get me through all the miles. I don’t count calories. I don’t deprive myself. But I try to eat real food and primarily vegetarian. Being prepared helps me to make healthier choices and avoid any “hangry” moments. Trust me, I’m not very fun when I’m super hungry. For the past year I’ve only eaten meat a couple times a week. I personally don’t like to cook it and I think it’s better for the environment to eat vegetarian. Plus, I feel like I eat better when I’m eating meat-free. I went completely meat-free this January and it was really easy for me. I don’t think I’ll ever define my diet as “vegetarian.” Not big on the label, because one day I might really want a piece of bacon. That’s okay. I eat to feel good and for me, that means less meat. Today I did a meal snapshot on my Instagram Story and I kind of liked it because it made me really pay attention to what I eat in a day. If you’re anything like me, you’re always looking for new healthy things to try, but you like to keep it simple. Simple works for me. I’m really busy and need to have meals prepped when the week begins. So, here’s a look at what a day of eating looks like for me. It was a Thursday, which means I was extra hungry…always am after my Wednesday night speed workouts, so I thought it was a good day to share. Breakfast was a cold brew smoothie. I tried to copy the “Lifeline” smoothie I had in Sedona, but I didn’t have dates in my apartment. 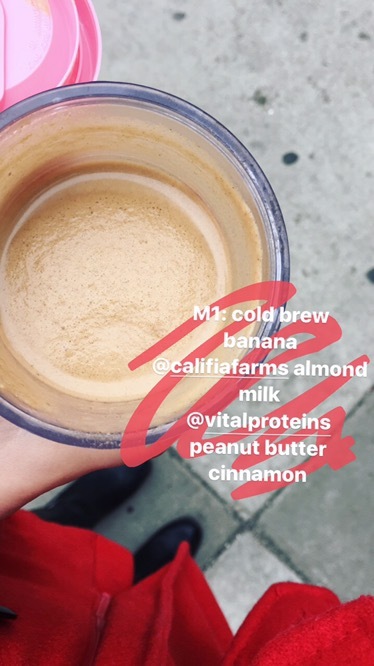 Ingredients: one banana, cup of homemade cold brew, splash of almond milk, one scoop of vital proteins collagen peptides, a tbsp of peanut butter, ice, and a dash of cinnamon. This combo was SO good. And I actually stayed full for a couple hours. Meal two was my first snack of the day. 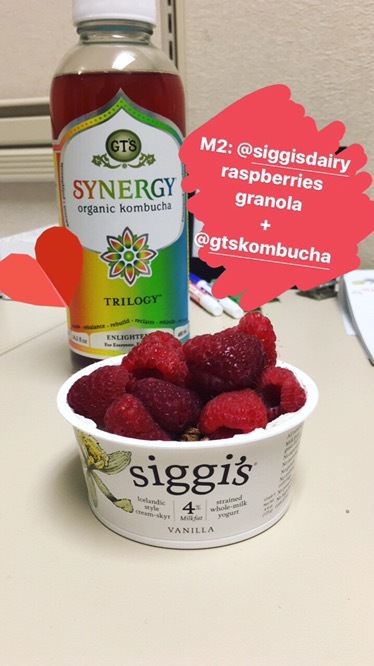 A Siggi’s yogurt with a little bit of granola and some raspberries. Full disclosure: I didn’t mean to buy the 4% milk fat kind. All the others I’ve had are less and I like the consistency more, but I still enjoyed this one. Fresh raspberries made it. And of course I had a kombucha. I’ve been having one kombucha a day for a couple months now and I’ve never felt better. It really helps my digestion and I truly enjoy drinking it. I’ve just gotten into brewing my own (hoping to save some money) and my first batch wasn’t great, but my second batch will be ready in a few days and I used a different tea, so I have high hopes! Lunch was easy. I prepped this on Sunday and had it every day this week. 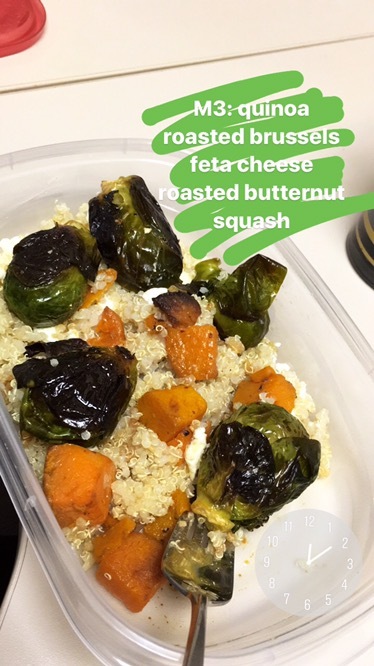 White quinoa topped with roasted brussels sprouts, roasted butternut squash, and some feta cheese. The flavor from the roasted veggies was good enough to not need a sauce or dressing of any kind. Brussels sprouts are my absolute favorite vegetable right now, so this simple lunch made me happy. Meal four was a protein bar — typically is for me since I fuel up around 3:30 PM for my evening workouts. 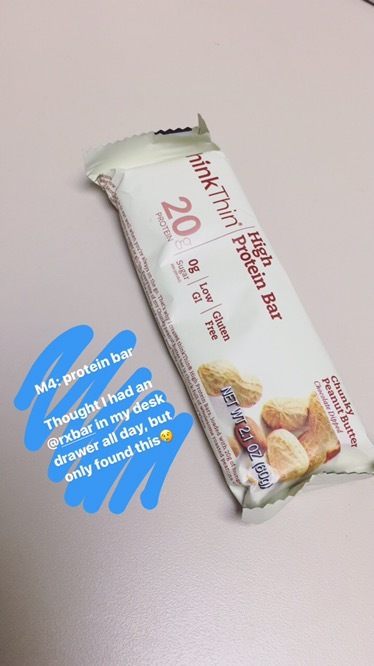 My favorite bars are RXBARs and I thought I had a Chocolate Sea Salt one in my desk drawer so I was looking forward to it all day. Turns out, I didn’t. I only had a Think Thin. Don’t get me wrong, I like these too, but I wish I hadn’t been craving the other kind all day! Dinner was around 7:30 PM after my 6 mile run and strength class at ENRGi. I came home hungry, so I was glad I had already roasted asparagus and chickpeas. 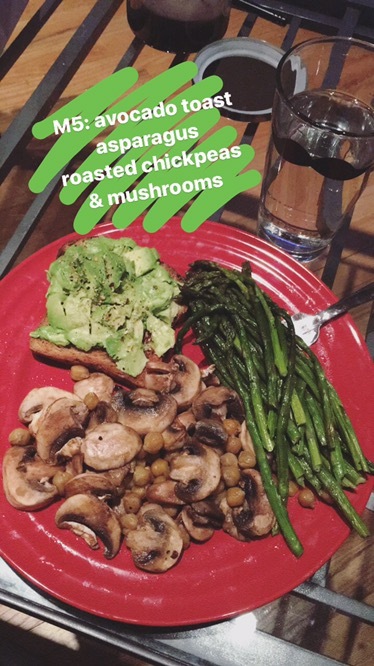 All I did was saute the rest of the mushrooms in my fridge, spread some avocado on some toast and called it a day. This was so easy to throw together and it was super filling. I loved having roasted chick peas on hand for a snack this week and I finished them up with dinner to make sure they didn’t go to waste. Simple vegetarian dinners don’t have to be boring. Okay I was satisfied after dinner, but I always crave something sweet at the end of the day. And I don’t like to deprive my sweet tooth. Dark chocolate is my favorite and there are a lot of healthier options out there. 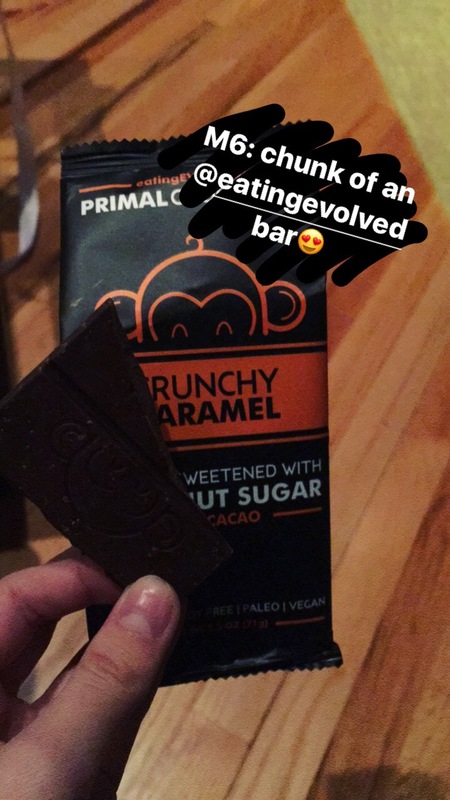 I had a chunk of this Eating Evolved bar and it hit the spot. I don’t feel guilty about it. Why should I? I work hard. I fuel my body. I enjoy my meals. I treat myself. Food is fuel. I truly believe that. I couldn’t do half of the things I do without proper fuel. I’m grateful to have access to delicious, healthy food all the time. So many people don’t have that luxury and I don’t take it for granted. Just like that six weeks have flown by. This week was one of my favorite so far because I got to explore new places, run lots of hills, and push myself with my long run. This was the highest mileage week yet and I’m feeling good. Early morning 7 miler through Sedona! I got to watch the sunrise and enjoy the fresh air. It just felt nice to be running in short sleeves outside in February. The route I took was definitely hilly which was tough after my hilly Saturday race, but I enjoyed the change of pace. Then Kyle and I spent the day hiking. No idea how far we went, but it was some great cross training. I loved spending time outside in the sun. Explored a super rocky trail for 4 miles to kick off my birthday! The terrain was tough to move quickly on, but I did what I could. And I didn’t twist my ankle which was all I wanted! I live for tough trail runs in new places. It was the best way to kick off 24. Almost missed my spin class due to turning off my alarm, but I sprinted to the studio and made it just in time. It felt like I hadn’t been to spin in awhile, so I was just happy to be there. Then after work I had my speed workout with the group. Mile repeats times 4, plus a warm up & cool down brought us to 8.18 miles. Repeats were all between 7:20-7:40 average pace which is even a littler faster than we wanted them to be, but we felt strong. I definitely wouldn’t push myself as hard during speed work if I didn’t have the group. I moved my rest day to today instead of Friday because I was really tired and sore. And I was hoping it would be a little warmer on Friday morning. It wasn’t warm. 14 degrees and windy, but I still got outside and got my 7 miles done. Held an 8:29 average pace and felt pretty good. I always enjoy running after a rest day. 18 hilly miles at 8:14 average pace. What?! I’m still in shock this happened. I was really nervous going into this run. Already hitting this high of mileage and running tough hills is intimidating, but this running group makes the miles fly by. I was really tired and had my doubts for the first 6 miles. But then I found my stride and felt a lot better. The hills are always tough, but they’re making me stronger. I can’t believe 8:14 pace is starting to feel like my easy pace. I really enjoyed this entire run. The company, the weather, the course. It’s nice to get out of the city. We killed it! Sundays are for cross training. Started my day with a 45 minute cycling class at Flywheel. High torq was tough on my sore legs and I struggled a bit, but it was still nice to flush out my legs. And I’m going to do a lot of stretching today! I feel like I’ve really hit my groove this training cycle. I’m hitting the miles, cross training, and holding faster paces. Training doesn’t feel like a burden, it’s just part of my life. I love it. I’d prefer to always be marathon training. And I can’t wait to see what the next 10 weeks hold! A race week and a drop down week! A little less mileage, but still kept up extra cross training. I was pretty sore going into my race on Saturday, but I still performed well. Tried my first Orange Theory class to see what it was all about. I started on the rower, then moved to strength circuits for the first half hour. Second half of class was spent on the treadmill where I covered 3 miles. The heart rate monitor concept is great in theory, but I had a really hard time keeping mine in the orange and red zones. And the competitive person in me was pretty upset to lose when I was running my sprints the fastest. Not really my thing, but I’m glad I tried it! Easy morning miles at 8:40 average pace to bring my January mileage total to exactly 140 miles! It was chilly, but felt good to get outside. I took a 6 AM Flywheel class to start the day, but I was on a broken bike and the class was pretty awful. I didn’t get enough out of it and it was frustrating, but at least I sweat. Second workout was my speed workout with the group after work. 800 meter repeats (6 reps) with 90 seconds of complete rest in between. With warm up and cool down it was 6.27 miles. Our average time for all reps was about a 3:25. Really happy with it!! 5:45 AM Torch class. Covered 2.1 miles during the treadmill sprints plus 3900 meters rowing and 20 minutes of strength circuits. Ran another 4 miles outside immediately after class to bring me to my 6.1 miles for the day! First complete rest day in a few weeks. I needed it. Plus I was traveling to Arizona, so it worked out well. I like to really rest my legs the day before a race. 13.1 miles for the Sedona Half Marathon! I absolutely loved this race. It was so so hilly and I had never even run at an altitude before, so it was tough, but I ran strong. I finished with a time of 1:43:20. 7:53 average pace. 1st place age group! I couldn’t believe how well I did. I’ll write a full race recap separately. After the race we hiked at least 6 miles, so my legs were very tired, but this is my favorite way to spend a day. Lots of miles and fresh air! Sedona is absolutely beautiful. Cross training today will be more hiking! Going up to the Grand Canyon to explore and then another hike back in Sedona later today. A lot more miles and climbs on very sore legs, but I’m happy about it. Really can’t think of a better way to spend a weekend! Extremely happy with how this week went. I could feel how much I’m improving from this training cycle already. And I realized how strong I am at running hills. I have a good feeling about how my March half marathon and my April full will go. Progress is fun to see. Onto week six!